As is well known, genetic information contained in the DNA sequences of the genome must be expressed as proteins before they can perform their designated functions. These proteins must fold into their specific three-dimensional structures that determine how they function. In addition, some proteins may be chemically modified after synthesis or converted from inactive to active forms. Moreover, different proteins may be synthesized in different tissues, or at different stages of development or in disease states. Thus, the complete understanding of living processes requires understanding of structure and function relationships in proteins. Thus, the "Center for Excellence in Protein and Enzyme Technology (CPET)" was founded as a Center for Excellence of Faculty of Science, Mahidol University 2001, to serve as an interdisciplinary research laboratory for elucidating the molecular basis of protein action and its relationship with three-dimensional structure. Staff in the Center come from various departments, namely Professor M.R. Jisnuson Svasti (Advisory), Dr. Jirundon Yuvaniyama and Professor Dr. Pimchai Chaiyen from the Biochemistry Department, Dr. Palangpol Kongsaeree from the Chemistry Department, and Dr. Pramvadee Wongsaengchantra from the Biotechnology Department. In addition, Professor William N. Lipscomb, Nobel Laureate in Chemistry from Harvard University, is an advisor to the Center, and was attached to the Center between June to September 2002, as the first Stang Mongkolsuk Distinguished Professor of the Faculty of Science, Mahidol University. The Faculty of Science has provided CPET with modern sophisticated equipment, including X-ray diffractometer system for studying the three-dimensional structure of proteins and stopped-flow spectrophotometry for studying enzyme mechanisms, as well as FPLC, HPLC, spectrophotometers and other equipment. Operational budget comes from several grants awarded to CPET staff, by various agencies, such as Mahidol University, Thailand Research Fund and BIOTEC. 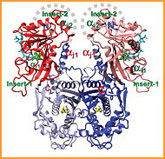 The complementary expertise of staff members and state-of-the-art equipment enables CPET to use a combination of structural biology, protein biochemistry, and mechanistic enzymology to study protein structure-function relationships and explore interesting problems at the interface of biochemistry and chemistry.